As a parent of a baby it is so exciting to watch them grow and change, each new step is a milestone. Rolling over is one of these, much longed for but when it happens you can quickly become frustrated at a baby who is constantly rolling in their sleep, getting stuck and then yelling to be rolled back. This can quickly become exhausting and frustrating. Your baby is simply busy practicing their new skill and while they are doing that they are not sleeping! There will be other skills that your baby will practice during their sleep time, like crawling, rocking on their knees, standing. While your baby is in their cot they will practice rolling and rolling. Sometimes the problem comes when they can first roll in one direction from their back to their tummy but can’t get back again. They can do this at the beginning of their sleeptime before they are even asleep or even during their sleep time and wake as a result and cry. Missing precious sleep. Lets talk safety first. Once your baby can roll you really need to stop swaddling/wrapping if you are still doing this. As you do not want a swaddled baby to roll face down. Plus the more they roll the swaddle will loosen and become undone and can become a big suffocation risk. Instead of swaddling/wrapping try a sleeping bag or just go without. If your baby is really struggling to sleep without anything then a sleeping bag will be perfect, it gives them the feeling of being snuggled but the freedom to move their arms and hands and roll. If you are using an angel sleeping bag – where your baby’s arms are fixed in an angel wrap position, it is definitely time to move on and let your baby have their arms free. Make sure there is nothing else in your baby’s cot just a fitted sheet. No pillows, toys, blankets. If your baby is cold then a sleeping bag is a must. Many parents feel like they need to flip their babies back over onto their backs when they roll onto their stomach. 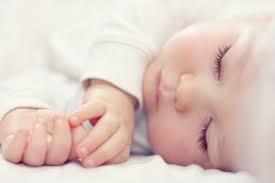 Once your baby is able to roll over it is safe to sleep on their stomach. You cannot hold back their natural development. If your baby cries however when they roll then you can go and roll them back onto their back. They will then drift off to sleep, this will usually last for 2-3 weeks until they learn to move themself both ways. If however this becomes a game and requires you moving them over every minute or two then my advice is to stop playing the game, your baby will calm down and find that they can sleep on their tummy and they are fine. Just remember this is part of your baby’s natural development, you cannot stop them rolling and they will soon learn to roll both ways. Give them plenty of tummy time on the floor at awake time for your baby to practice!